This Week’s Topic is: Imagine you get to open your own bookstore. What would it look like? What kinds of books would you sell? My son got present obsessed during Christmas, a totally normal and completely enraging pastime for three year olds. After the initial panic that present time was over wound down, Sam began to ask, “What present do you want?”, whenever he got bored. Whoever was around had to answer him, and then ask him the question in return. His answers range from a Spiderman bounce house, to a trip to the moon, to a puppy, etc., etc., etc.. The truth is, I have always dreamed of a room with books lining walls. When I was in my early teens the movie You’ve Got Mail was released. I wanted that bookstore. That home for books, where quirky people found not only a wonderful new companion made by words, but also answers and true friendship. This makes me sound like a romantic, which I guess I am, to an extent. Or maybe I’m an idealist. Maybe my fantasy bookstore only exists in a movie, but it’s a fantasy, so that’s OK. In my hometown of Denton, TX, there is a wonderful place called “The Recycled Bookstore”. It’s housed in the old Opera House, and jammed full of thousands of books, vinyl records, DVD’s and even VHS’s. When I was young, I thought the place was haunted. My friends and I would go there to get Nancy Drew books and search for wandering spirits. My bookstore wouldn’t only be about the books, it would be about the atmosphere. It would be a place to go, not just to buy. It would be a retreat from the normal world because that’s what books are. Books are our way to more. The other day Sam came to me in the kitchen while I was cooking. He and his dad had been playing “store”, and he had bought me a present. In his hand was my library. He is made of cuteness. This is the consensus. I always prefer going to a bookstore to ordering online. Don’t get me wrong, I shop on my Kindle as well, but only when I’m in desperate need or when the book I seek has only been published in e-format. The experience can be almost as important, or in some cases affect the purchase, and that is a wonderful thing. I would hate to see that lost. In an old opera house! How freaking cool. I love that you shared that with your son, and his gift to you. What a sweetie. I agree with you also that atmosphere is the most important thing! Got to make it a third place, you know? Absolutely! While I was working on one of the bigger revisions on my manuscript most of my writing took place in a cafe because my son was with a babysitter. I kind of loved it, sometimes even more than working at home. I also talked about You’ve Got Mail in my post today (how silly is it that people think it’s a romantic comedy about Meg Ryan and Tom Hanks? Clearly it’s a tragedy about Meg Ryan and that gorgeous bookstore!) That’s a great story about your son–I am still waiting for my library but my husband is on board with making built-in shelves a priority when we are house hunting someday! 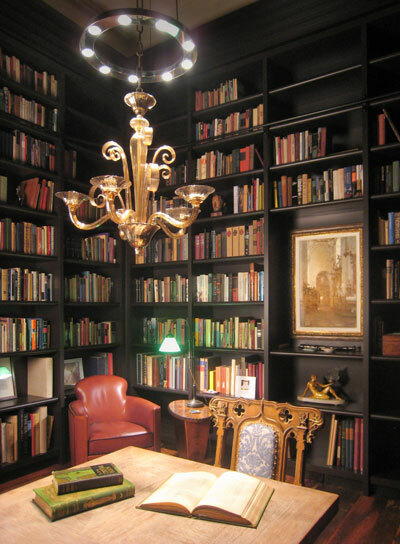 I long for a home with walls made of bookshelves! Good to have a handy husband to makes those dreams a reality. He’s a love-muffin. I think a lot of writers, especially who go into writing YA are romantics to the core. We have to be to invest some much tim in fictional romance and worlds built on fantasy. I’ve been to Denton. How I wish I’d known that place existed! Sounds awesome! Wow, you’ve been to Denton! That’s impressive. It is on the Denton Square, Oak and Locust Street. Too bad you missed it. I agree, that if you’re going to take the trouble to get yourself to the bookstore (read: put on pants), it should give you a reason besides the books to do it. For me it’s all about the atmosphere – and it sounds like yours has an awesome one! Awww… your son sounds like a sweetie pie. That used bookstore looks awesome! 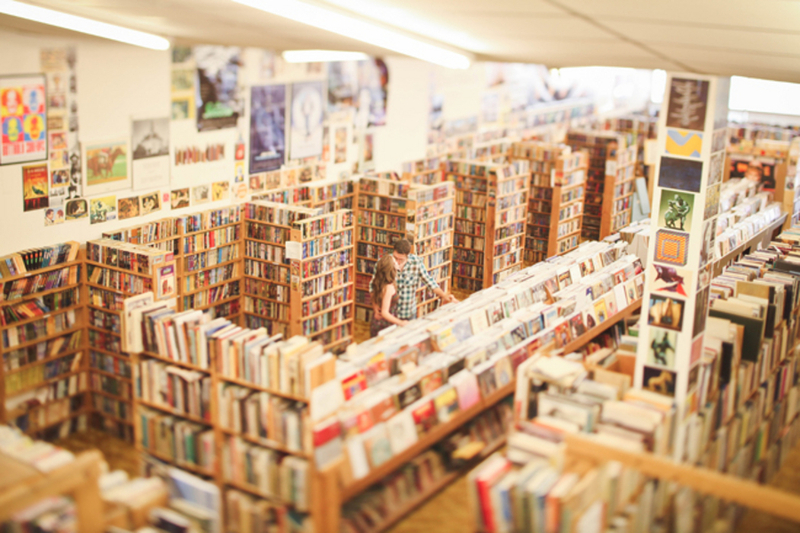 I used to love digging through the used bookstore as a kid. It felt like a treasure hunt. I agree completely about bookshops being about the atmosphere! And you son sounds too cute! I have always loved reading. Our kids and grands did. Now they use a kindle. It’s not the same. I like looking at my books on the shelves of my bookcase! I just finished another book. I’ve got so many to read. I feel that way about my reading list as well. It is constantly growing, no matter how much I read. Check out the bookstore, it’s fun! P. S. I always wanted a huge library with the sliding ladder!! Ahh, what a sweet present from your son. The Recycled Bookstore sounds great. I’ll have to check it out if I ever go to Texas again. This was such a sweet, heart warming story; thank you for sharing!